The global market for broadcast switchers is somewhat fragmented, by virtue of the existence of a considerable number of market players, states Transparency Market Research (TMR). In 2014, the topmost four companies accounted for a massive share of 46% in the global broadcast switcher market. These were Snell Ltd., Grass Valley, Panasonic Corporation, and Ross Video. Development of 4K resolution broadcast switchers has been a key area of focus for several market players. The adoption of business strategies such as collaborations, partnerships, acquisitions, product launches, and mergers is quite frequent in the competitive landscape of the global broadcast switchers market. A number of novel broadcast switches are being recognized by regulatory bodies and related organizations. For example, in May 2017, Broadcast Pix™ announced that it won NewBay’s Best of Show Award at 2017 NAB Show conducted in the preceding month by TV Technology for its new product. The new integrated video production switchers’ family, BPswitch™ offers several advanced features. For instance, it allows complete access to clips, switching, CG, and robotic camera control from any smart devices such as smartphones, laptops, and tablets. It is highly apt at delivering live production flexibility to video professionals. In 2015, the global broadcast switches market was pegged at US$1.45 bn. The global market for broadcast switchers is expanding at a CAGR of 6.1% during the forecast period 2015-2024, reaching US$2.47 bn by the end of 2024. 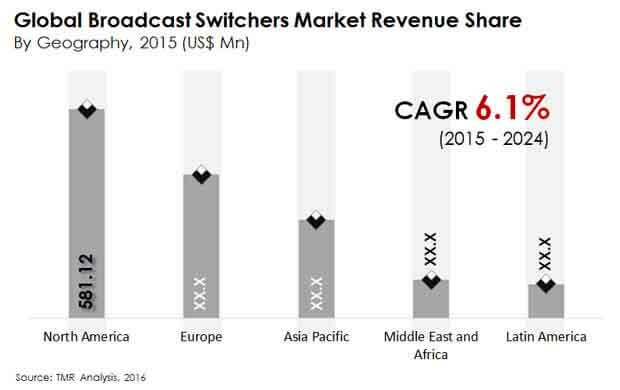 In 2014, North America emerged as the dominant regional segment in the global broadcast switchers market. The market in this region is being propelled by upgrading of outdated switchers, apart from extensive sports broadcasting and studio production. By application, the studio production segment held the largest share of 24.9% in the global broadcast switchers market. The remarkable growth of this application segment can be attributed to a high preference for studio production among business owners, by virtue of its capability of easily adapting to SD and HD content. The rising popularity of digital video services as well as growing penetration of television sets across developed and developing countries alike has been one of the major catalysts of the global broadcast switchers market. Several service providers are deploying broadcast switchers because of the complications associated with the broadcasting of high definition (HD) and ultra-high definition (UHD) videos. The stiffened competition among the leading market players has also been aiding the progress of the global broadcast switchers market. As the number of sports events which are being streamed are escalating to a great degree, the global broadcast switchers market is expected to reach a higher revenue by the end of 2024. Broadcast switchers is an excellent solution for transmitting seamless videos, which is essential in sports broadcasting. On the contrary, the global market for broadcast switchers is being restricted by the need for vast investments in equipment such as on-field audio recorders, camera control units, encoders, and light equipment cables. However, the market can recover from the loss incurred on account of this market restraint via substantial growth opportunities held by developing nations such as Brazil, Nigeria, Ukraine, India, and Mexico. The information presented in this review is based on a Transparency Market Research report, titled, “Global Broadcast Switchers Market (Product Type - Production Switchers, Master Control Switchers, and Routing Switchers; Application - Studio production, Production Trucks, News Production, Sports Broadcasting, and Post-production; Type of Ports - Uncompressed IP, Coaxial, and Compressed IP; and Video Resolution - 4K, 1080i, 1080p, and SD) - Global Industry Analysis, Size, Share, Growth, Trends and Forecast 2016 - 2024”.